Take a pan and heat oil. Add onions and sauté it for 2-3 minutes. Add salt, pepper, oregano, ginger and green chillies paste and mix it well.Add potatoes, capsicum and sauté for a minute. Add rajma and mix it well. Cook on a low for a minute. Let it cool. For serving – Take baskets in a dish. 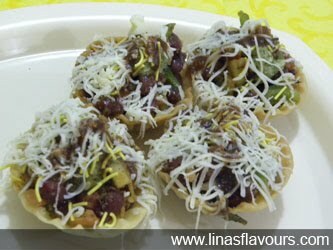 Add rajma mixture and top it up with grated cheese and sev. Note: You can add tamarind chutney and green chutney if you like.